Despite formal permission being sought from the Indonesian police in Papua to conduct acts of free expression, Papua Police Chief Tito Karnavian rejected the permit due to the political and “separatist” nature of the rallies, according to KNPB spokesman Wim Medlama. Karnavian, the former commander of Australia-funded anti-terror police unit Detachment 88, authorised the deployment of thousands of heavily armed police and military to prevent the commemorations from occurring, according to local human rights sources. Police banned rallies from going ahead in Jayapura, Waena, Sentani, Boven Digul, Merauke, Biak, Kaimana, Nabire and Timika, however participants were allowed eventually to hold prayer sessions under tight military and police surveillance and a show of force in Biak and Nabire, according to KNPB sources. In Timika, according to West Papua Media sources, several thousand people ignored the police ban and show of force and joined the KNPB event at Jayanti field in Timika. Credible human rights sources have also reported that in several centres across Papua, combined Indonesian security forces of the Army (TNI), Brimob paramilitary police, and plain clothes members of Detachment 88 physically blockaded and prevented demonstrations from going ahead with dispersals and beatings in several centres. In Merauke, police and undercover personnel said by credible sources to be members of Detachment 88, were conducting heavy surveillance of local people whilst blockading roads to prevent people from accessing the commemorations at the KNPB Merauke office. While this peaceful demonstration was dispersed, another gathering at the Highland people’s housing complex Perumnas III in Waena, was blockaded by police under the command of Jayapura Police Chief Commissioner Alfred Papare. This gathering was then surrounded by the police and army and were forced out of the area, according to the KNPB and confirmed by WPM stringers. Suhuniap explained “Until the afternoon the demonstrators were violently dispersed by the combined police and army forces and assisted by the Papuan police’s special operations forces,” referring to uniformed members of the Australian trained counter-terror unit Detachment 88. KNPB activists told WPM that they observed the army and police were prepared to suppress KNPB members with force, heavy weapons, assault vehicles and armoured vehicles. Over 200 police, including 50 fully armed Brimob paramilitary police and a platoon of TNI soldiers, and scores of plain clothes intelligence – said by KNPB to be members of Detachment 88 – participated in the dispersal and blockading the peaceful demonstrators of KNPB. 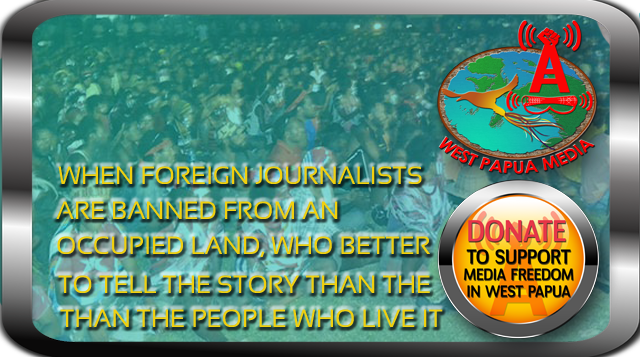 West Papua Media has been unable to confirm independently if any people in Jayapura were injured during the dispersal. Meanwhile in Boven Digul, KNPB sources reported that Indonesian police took to local radio stations to announce the prohibition of freedom of expression, telling local people not to participate in KNPB actions. All local people were stopped and searched, with police allegedly confiscating cameras from citizen journalists. In Kaimana, on the south west coast of Papua, Tabloid Jubi has reported that rally organisers decided to hold a prayer service instead to commemorate the IPWP anniversary. However, police banned that too and came to arrest organisers. A night of terror and shootings was reportedly unleashed by Indonesian security forces against KNPB members’ families after the commemorations in Kaimana. Police Special Forces raided the KNPB Kaimana offices three times during the night of October 16, with the first raid occurring at 2130. Six shots were fired into the house from Police rifles during the first raid. Three residents, Barias Wesfete, Demianus (Luter) Baunu and Jesse Irini were severely beaten and arrested by police. However, according to KNPB spokesman Medlama when interviewed by WPM partner Tabloid Jubi, Police returned twice more during the night, with at least ten bullets shot by Police to the house at different times throughout. “The first shooting at 9:30 pm, was 6 times (shots.) The second shooting at 2 o’clock at night up to 2 times, and the third time at 4 am as much as 2 times,” Medlama told Jubi. The three Kaimana arrestees returned home the morning after, however no information has been received of their charges, if any. Jubi reports that the KNPB assessed that police are just looking for an excuse to put extreme psychological pressure on Papuan people, in ways that make no sense. “We are not concerned with their efforts to pressure us. We only know one word – LAWAN”.